The three memorials for members of the Campbell family contain an unusual amount of biographical information and resemble obituaries. See below for the complete text. Photograph by George P. Landow. To the Memory of Sir NEIL CAMPBELL, C.B. Colonel of the Royal African Corps, [Governor?] Commander in chief of Sierra Leone and its dependencies. 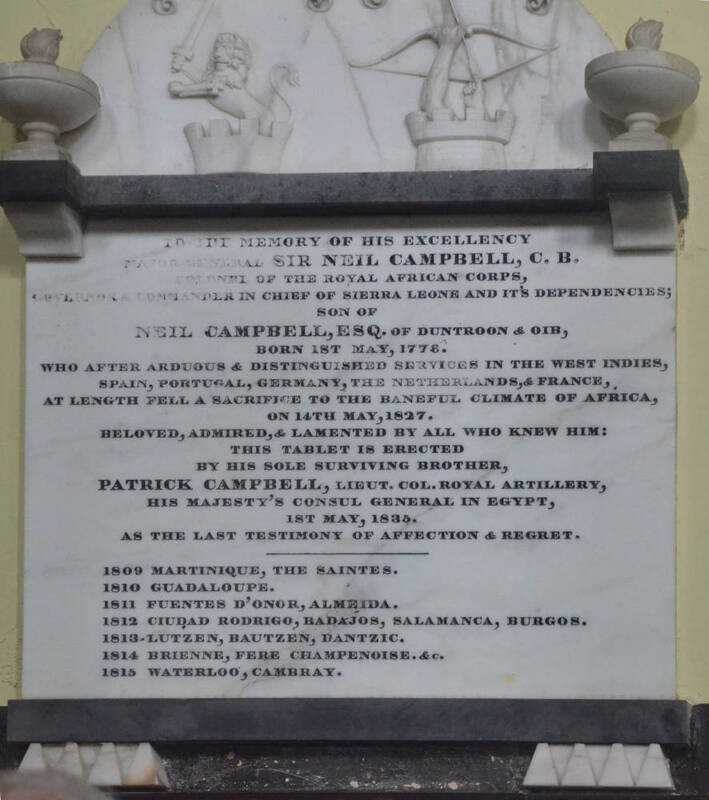 Son of NEIL CAMPBELL, Esq, of DUNTROON and OIB, Born 1st May, 1776. Who after arduous & distinguished services in the West Indies, Spain, Portugal, Germany, the Netherlands, & France, at length fell a sacrifice to the baneful climate of Africa,on 14th May, 1827. Beloved, admired, and lamented by all who knew him" This tablet is erected by his sole surviving brother, Patrick Campbell Lieut Col. Royal Artillery, His Majesty’s Consul General in Egypt, 1st May, 1835. As the last testimony of affection & regret. 1812 Cuidad Rodrigo, Badajos, Salamanaca, Burgos.